the first word you ever spoke. Beautiful boy, riddle me this. I know every spell you ever cast. could hear the dragons fighting in their roots. Only for a moment, I looked away. 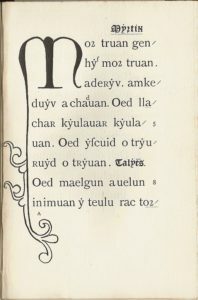 Page of an edition (1907, J. Gwenogvryn Evans) of the Black Book of Carmarthen (1250).